My West Texas.com reports that mezzo-soprano Susan Graham will sing a FREE concert on Friday night, September 5th, at First United Methodist Church in Midland, Texas. Susan grew up in Midland and the homefolks know how to show her that they are proud of her. This free concert commemorates the Third Annual Susan Graham Day in Midland. The program will include works from operas as well as Broadway numbers. Susan will be accompanied by Doug Montgomery, another West Texan. He will perform a set by himself. The event is sponsored by the Midland Opera Theatre. If my people at home don't get these FREE tickets and go in my place, I shall be forced to disown them, at least temporarily. 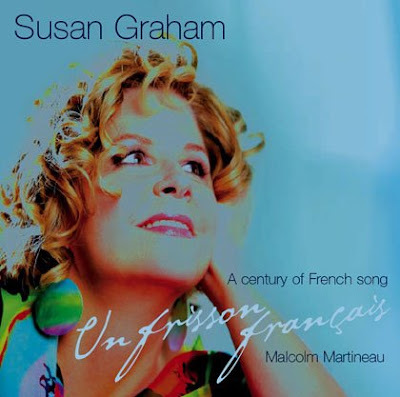 Meanwhile, the electronic version of Susan's new album Un frisson français is available via download at Onyx Classics, before you can buy it in the stores on October 14th. Get it. C'est divin!